The Wattle Woods seat is on the main path through the Wattle Woods. It is built from a railway sleeper resting on two brick columns. 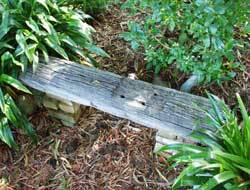 This seat is in a magic spot - it is a log of wood floating in a sea of green Renga Renga leaves. It's peaceful and sheltered here in the dappled shade of the huge Wattles, where a large family of fantails has a permanent base. 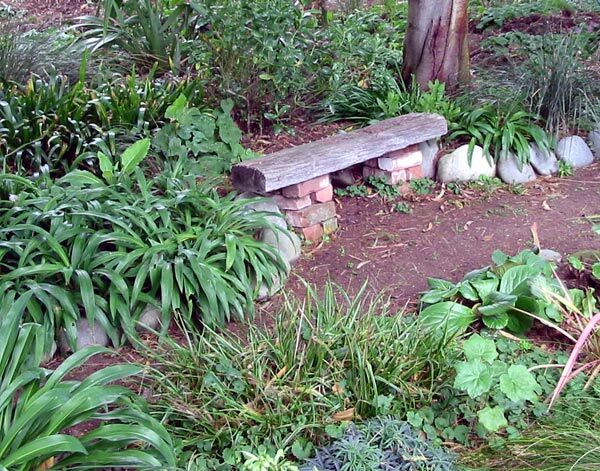 Directly in front of the seat is a small triangular garden full of bergenias, hellebores, and a spotty leaved pulmonaria. A small path can be seen disappearing from here through a carpet of ajuga towards the glass-house. There are two variegated carexes alongside the path, several rhododendrons, and drifts of bluebells and snowdrops in spring. This seat gives you good views of many areas of the garden. I can peep out to the Pond Paddock and see the decking and the pond-side plantings. Or I can look up the path towards the water race and the new gardens further on. On still days the water running through the race can be easily heard. Sitting on the seat looking up to the glass-house I can see the JAM garden, with treasured plants donated by my good friend Judith Anne. Her favourite roses are still happily established next to my rugosa rose collection. What a pity that I don't know many of their names! The Wattles to the back are underplanted with hebes and flaxes, and in Spring this area is full of self seeded white honesty. 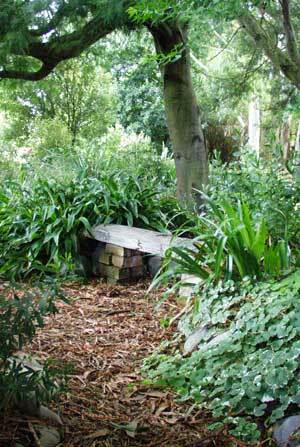 It's a dry difficult area, and hard to keep clear of fallen gum leaves and strips of gum bark. Only tough plants survive. My favourite and much maligned variegated mallows also live here, in front of two favourites - Cotinus and Miscanthus Zebrinus. There are many small patches of spring daffodils, too. The Wattle Woods have survived a few winter snow storms - the last was in the year 2003. Many Wattle branches came crashing down with the weight of the wet snow, and there was much mess. The white rhododendrons (Everest) were smashed and splintered - I never liked them much, anyway!